where is the complete feature-feature coupling matrix (such as a giant TFIDF matrix for all the term, tags, and other features in a large document collection) and is the dominant eigenvalue of . is useful for dimensional reduction when the hidden dimensions are actually useful and not just noise. It is necessary, however, to solve find the dominant eigenvalue of . In some cases, however, it may be quite hard to find this eigenvalue. In other cases, we may want to de-noise or regularize the hidden variables. Or perhaps there is clearly more than just one dominate eigenvalue? What can we do? We now introduce the Eigenvalue-Independent Effective (Semantic) Operator , using techniques from quantum mechanical many body perturbation theory (MBPT), that resolves all of these issues. Our goal is then to find that satisfies (7) for every eigenvector in the primary space P simultaneously. There are many ways to do this in the chemical physics literature; here I will explain the ones I believe that may have application in Machine Learning. In particular, we do not seek an exact Effective Operator since , usually in Machine Learning, our input data is noisy and may only have a few significant figures. Indeed, we expect that an approximate Effective Operator will perform better than the exact solution. Also, we may want to add a regularizer, and we will need a formalism that permits this. Finally, we are not really trying to model an eigenvalue problem but rather the (semantic) feature-feature similarities. Consequently, we will need a formalism that lets us treats features explicitly, and does not just model the eigenvalues and eigenvectors of . In the language of Effective Operators, this means the Primary Space must be a Complete Model Space. So how do we get here? While the final result is quite simple, the road to get there is long and technical. Lower case letters (p) refers to primitive features like tags , words, etc. In physics and chemistry, is the Fock Space. Here I sketch the possible eigenvalues of the feature density matrix ; you can also think of these as the singular values arising from an SVD/LSA like calculation. First, note that we expect the largest eigenvalues to correspond to eigenvectors that are dominated by the P-space features (p), and we refer to these as the P-space eigenvalues. Ideally, we might hope that we can identify a complete set of high lying eigenvectors that are totally dominated by the P-space features. That is, t if we were to run SVD/LSA, then we expect that lowest clusters / singular vectors would be dominated by P-space features. 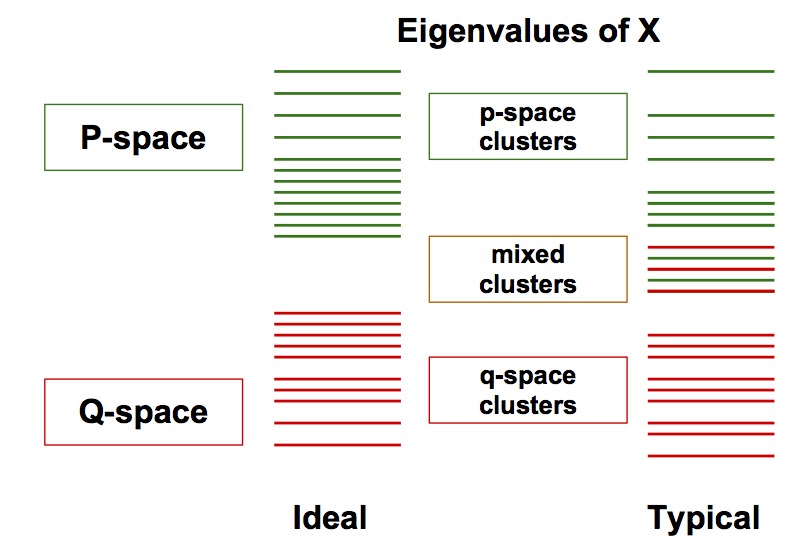 Typically, however, we may observe that only the few largest eigenvalues as dominated by P-space features (and the smallest by Q-space features), whereas the mid-range eigenvectors are harder to classify. Hence the need for a simple model. It is precisely this distinction among features — the ability to identify a dominate class of features — that allows us to apply the Effective Operator technique. In some cases, this will be self-evident. In others, it might seem fictitious since we decided beforehand how to construct the feature density matrix . I will address various examples in a future post–for now, I would like to get the basic mathematical result. We call the model space a Complete Model Space because it is spanned only by the p-space features. Notice this is space (while isomorphic to) is quite different from the P-space we might obtain from taking the first eigenfunctions of because these latter functions have non-zero Q-space features weights. Indeed, we are , in the most literal sense, constructing a Model for our problem, and seeking to describe the true situation with this highly accurate, de-noised, interpretable and explainable model. We will chose a partitioning that reflects both our physical knowledge of the system and our noise. In particular, we will assume carries the noise, and therefore we only include a small piece of . Indeed, rather than Regularize, which is the standard Machine Learning approach, we will assume that we can treat the noise using low-order perturbation theory, and 1 or more adjustable parameters. We will now solve this equation using a low order Perturbation Theory. We achieve this by forming an order-by-order expansion. We shall solve this by means of a Resolvent Operator. Please stay tuned…this will take a while to finish….and to get the Latex formatting to work properly!